Perfect for a shasta daisy themed wedding shower celebration! 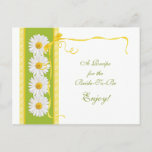 Green, white and golden yellow shasta daisy and ribbon bridal shower invitation. Cheerful and pretty for a spring or summer wedding shower. Personalize the text on the Zazzle website.